A great example of the decoratively hand-carved complete pattern from the Olympic's first-class grand staircase. Made from the finest quarter-cut English oak, this frieze was installed near the ceiling level of the first-class staircase foyers. The paint has been stripped away to show how it would have actually appeared when it was first built as a luxury liner. 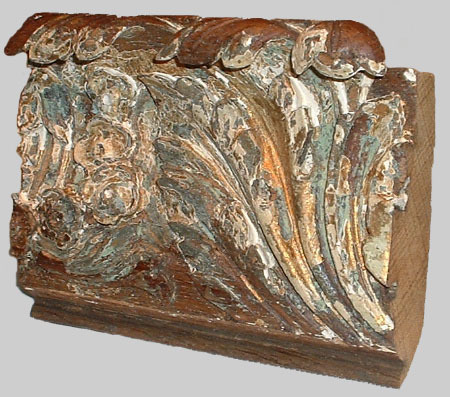 This piece shows the various layers of paint that was applied during Olympic's time. When built it was natural dark oak then later it was painted green, wiped over (antiqued, if you will) with an amber tone. Carved areas with relief were then dry-brushed/highlighted with gold paint. Lastly it was painted an antique white. These particular oak carvings seem to have originated from lot 3521 as noted in Catalogue of Messrs. Knight, Frank & Rutley's ninth day sale of the R.M.S. Olympic at Jarrow Docks, Friday November 15, 1935. It was purchased by Smith and Walton paint makers and installed in Akzo Nobel Paint works in Haltwhistle.